Linen closets often become catchall dumping grounds, but a few, easy-to-maintain steps will keep this space tidy and serene. It’s 5 o’clock on a Friday, and your weekend houseguests will be arriving within the hour. There’s no need to panic; getting beds and rooms prepped is so much simpler with a streamlined, organized linen closet. Linen closets often become catchall dumping grounds, but a few easy-to-maintain steps will keep this space tidy and serene. No one has time to fumble around in a messy linen closet looking for sheets that match. and towels simply and keep them grouped according to the room in which they will be used. A bottom and top sheet as well as pillowcases, plus a facecloth and a towel or two for each guest should be sufficient. Bonus points for tying each“package” of linens together with pretty ribbon. You can also neatly slip sheet sets inside pillowcases as another grouping method. that you have carefully undertaken). Don’t worry if your folding skills aren’t hotel-caliber. Using pretty, functional boxes will keep your closet’s interior looking sleek and organized. Having extra linens is never a bad idea, especially if you often have a rotating cast of houseguests within a short period of time. Keeping a few additional sets will allow you to skip linen laundry duty while you are entertaining. Having extra sheets for kids’ beds is an especially good idea since accidents definitely do happen! Extra pillows (of different sizes and firmness) always get used as well. 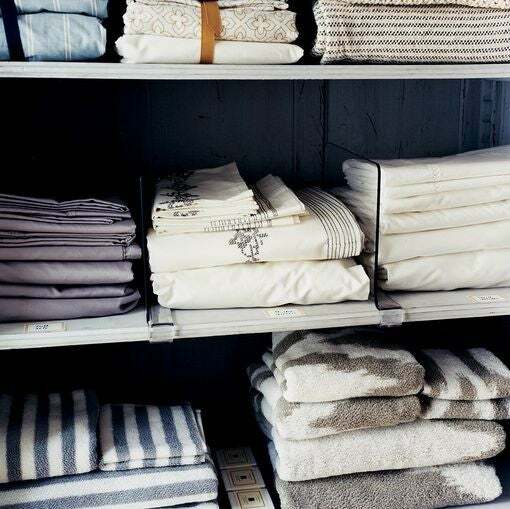 One of the easiest ways to keep your linen closet looking unified is to stick to a simple color palette. Using basic or neutral and interchangeable colors for linens and towels make it easier to organize your closet for grab-and-go use. You may be hesitant to experiment with dramatic patterns or colors elsewhere in your house, but a linen closet is a perfect place to play with a look or hue. You’ll look forward to the splash of glamour every time you open the door. Adding the wallpaper or contact paper also gives you an excuse to take EVERYTHING out of the closet, an important step in getting rid of any items that are stained, ripped, or that were purchased to fit your college dorm room. If you don’t have a linen closet, you can create a sneaky storage space by adding shelving into an existing nook or corner. Cover the makeshift closet with drapes or a curtain that matches the room’s decor for a hidden and functional space. Sheets, pillowcases, blankets, and towels aren’t the only things that belong in a linen closet. If you have limited space under the sink or in your bathroom, you can also use the linen closet as a central storage location for toiletries such as toilet paper, extra toothpaste and toothbrushes, or any other items you want to keep on hand for guests. Corral them in boxes or containers as well to keep the space as tidy as possible. Just resist using the linen closet as a dumping ground for holiday decorations and discarded art projects. (It’s happened to the best of us). Happy organizing!